I imagine you all have been eagerly anticipating the new Red Wings arena, so I’m pleased to inform you that the design for the new $450 million arena has now been released. $450 million sounds like a lot, but only around $280 million will be publicly financed. Chump change! I’m pretty sure we spend that on corn farmers in a single week. If you’ve never been, parts of Detroit look so bad that you forget you’re in America. So how is the city paying for this arena? Well, it kind of comes from the Detroit Public School system — the Downtown Development Authority, who is footing much of the bill, is allowed to take the school-tax funds for anything related to economic development. Because sports and stuff = thriving economy. Of course, sports get another perk in Detroit — free water! Who owes the most money to the DWSD? Oh, okay. So who is getting their water shut off in Detroit? Just the regular consumers who owe over $150. Look, sports are important. They bring in so much money for Detroit. DWSD can’t just be shutting off the water at arenas and stadiums. Probably all those people not paying their water bills are busy spending their money at the stadiums!! Look at all that cash flowing in from sports! Miguel Cabrera alone is raking in $292 million; I can’t even imagine what that translates into for the Detroit economy. Trickle down! Of course, the arena will create jobs — 1,100 of them, to be exact. Good! With only 165,488 unemployed people in Detroit, taxpayers will only need to shell out $38,700,000,000 for everyone in Detroit to get a job! 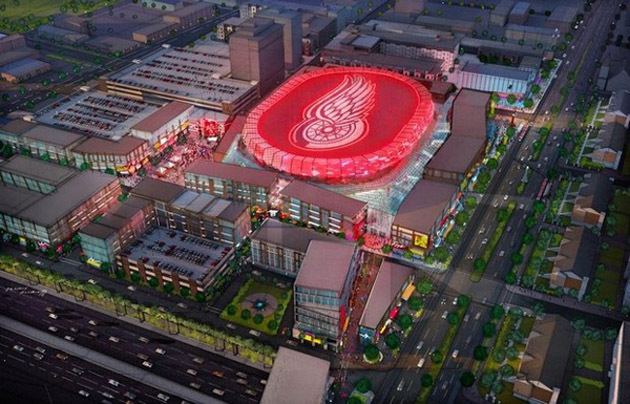 I think Mike Ilitch, the man behind this, has done a lot of Detroit. I don’t hate him. But I know that I do not trust this arena or its promises at all — I expect this to be more gentrification of the immediate area, and a lot less revitalizing. I do not trust that anything will be done correctly in the construction of this arena, given the water bill issue. Detroit has problems that run so deep it’s impossible to create 1,100 jobs and act like something is actually being done. There’s ways to backhandedly get $280 million to rebuild a stadium, but no one can make the argument that buying school and city buses that can actually run in the cold is economic revitalization? Jesus Christ — if you depend on the buses in Detroit in the winter, you’re screwed because half the time it’s too damn cold for them to come get you. Cities don’t even make money off of stadiums, so this whole thing is a joke. I don’t believe that in an area without real public transit (sorry, PeopleMover), an expensive stadium will change life for most Detroiters. Detroit is a hockey town, but maybe it’s time people sit back and remember that Detroit is also a shipping town. Priorities. Wow, this was a great post. I never realized how little these teams actually benefit the cities they “represent”. The more I reread this and read the last article you linked, the more I’m “WTF”ing over how much a city will pay to attract a sports team. Seriously, what is wrong with the world? We are doomed. I know, it’s INSANE. You should look at how much money PG allocated to make National Harbor the new home of Disney…which any reasonable person could’ve realized it wouldn’t work since we get snow and whatnot.